Daily Illuminator: Want To Try The Munchkin CCG At Your Local Game Store? December 28, 2017: Want To Try The Munchkin CCG At Your Local Game Store? Maybe you want to try out the Munchkin Collectible Card Game when it comes out next year, but you know you'll need other players. Or maybe you're behind it already and just want to make sure you can find plenty of other folks to throw down with. There are a couple benefits to making sure your local area has a Release Event or two going on! Official Release Events will have prizes. We're doing all we can to ensure every store that runs a Release Event gets an Organized Play Kit, which contains both plenty of participation prizes and some of a rarer prize. The kit also comes with a stack of the Neutral Hero card that stores need to give players if they run a draft, which is one of the most fun ways to play as a beginner. We aim for our Release Events to get a good turnout, too. We'll give each participating store a poster with the Wizard Hero on it to help them promote the event in store. And we're putting our social-media accounts behind promoting stores running Release Events. So if your hope is for a big turnout to be sure you've got plenty of people to play with, make sure your favorite store is on our list! Oh, and if you like that idea, you can also let your local store know about the Day of Wreckoning, another official and promoted play event, this one about a month after the game's release. 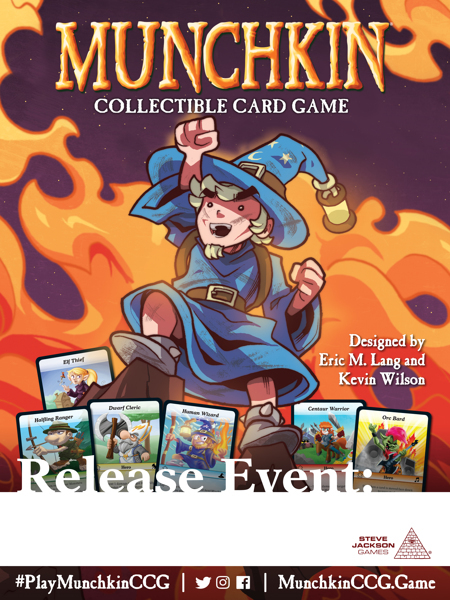 This event hopes to give you the chance to test out your freshly honed Munchkin Collectible Card Game skills. In the meantime, you can also place a preorder with your local game store, get ready to crush your competition with our how-to-play videos and strategy articles, or just enjoy the holidays and try to avoid the Krampus.